Do you know someone in your team who might be interested in an experiential leadership opportunity? The UBC Community Leadership Program (CLP) is an innovative leadership development opportunity designed for emerging staff, faculty, and graduate student leaders to enhance their leadership, lead and develop a team, develop practical project management skills, and learn how to build community. Both sessions will be held in Room 610, TEF III, 6190 Agronomy Road. If you can’t attend one of the information sessions and have questions about the program, please email Stephanie Thorpe, Workplace Learning Facilitator. UBC has been recognized as one of Canada’s Best Diversity Employers in 2019. These awards recognize Canadian companies that stand out through their efforts to create inclusive and respectful workplaces. UBC created an Indian Residential School History and Dialogue Centre to provide former students with access to the records of the Truth and Reconciliation Commission of Canada, as well as facilitate understanding of the history and impact of residential schools for the UBC community and provide context for contemporary relationships. UBC maintains an Equity Enhancement Fund to support collaborative student, faculty and staff projects that advance equity and inclusion — in the past year, the fund was used for several projects to enhance UBC’s curriculum through the inclusion of the indigenous way of knowing, knowledge and perspectives. UBC manages the Beyond the Binary project to address gaps in awareness and inclusion of trans and gender diverse individuals through staff and faculty training — topics include trans accommodation needs, respectful language and pronoun usage. Read more about why UBC is a Top Employer at https://content.eluta.ca/top-employer-ubc. Would you like to learn more about how to positively impact the climate for diversity in the workplace? The Equity & Inclusion Office offers support and resources to help build a community in which human rights are respected, and equity and inclusion are embedded in all areas of life at UBC. We all know UBC staff who make outstanding contributions to the university community. We invite you to recognize them and their achievements by nominating them for the 2019 President’s Service Award for Excellence and President’s Staff Awards (Vancouver campus). Download the nomination package at http://www.focusonpeople.ubc.ca/awards/presidents-awards-for-staff/. The nomination deadline is 4:00 p.m., Friday, March 15, 2019. This award is open to all UBC staff with 10 or more years of service. Up to five recipients are selected each year. The awards are presented during Graduation ceremonies, and each recipient receives a medal and $5,000. Up to 14 recipients are selected each year (two awards per category), and each recipient receives $2,000. Please visit http://www.focusonpeople.ubc.ca/awards/presidents-awards-for-staff/ for more information and to read past recipient profiles. UBC is recognized as one of BC’s Top Employers in 2019. This designation recognizes the British Columbian employers that lead their industries in offering exceptional places to work and the most progressive and forward-thinking programs. UBC offers a Healthy Workplace Initiatives Fund to support employee-led grassroots activities that promote wellbeing in the workplace — the unique program features one-time start-up funds and support for health-related and sustainable initiatives, from yoga classes to bike-share programs to building their own community gardens. UBC provides new moms and dads maternity and parental leave top-up payments (varying by position); and faculty, staff and students can take advantage of on-campus daycare centres, which have over 600 spaces for children. UBC employees work at one of Canada’s most beautiful campuses, which features a shoreline hiking trail and great views of the distant mountains and the surrounding Salish Sea — employees are also encouraged to keep fit with subsidized membership to the onsite state-of-the-art fitness facility that includes instructor-led classes, swimming, skating, tennis, rock climbing and more. Read more about BC’s Top Employers awards at http://www.canadastop100.com/bc/. Looking to join UBC? Check out our career listings at http://www.hr.ubc.ca/careers/. UBC has been recognized as one of Canada’s Top Employers for Young People in 2019, the only Canadian post-secondary institution to receive this designation. This special designation recognizes the employers that offer the nation’s best workplaces and programs for young people starting their careers. A variety of in-house learning and development programs, including the award winning Coaching@UBC program, career and personal development workshops, and an academic leadership development program for faculty. Young employees and employees who are new to the workplace can take part in many UBC programs and initiatives to help welcome them to the community and grow in their careers, such as university-wide orientation and in-house apprenticeship and skilled trades training programs. UBC employees can access career navigation services, professional development funding and tuition waivers. As part of the university community, faculty and staff are encouraged to take part in workplace wellbeing initiatives, and access the athletics and recreation facilities at our Vancouver and Okanagan campuses as well as UBC’s many attractions. Read more about Canada’s Top Employers awards at http://www.canadastop100.com/young_people/. In the world of organizational development, coaching has become the most effective tool to accelerate results in learning and professional development and building engaged workplaces. UBC has received the 2018 Honourable Mention for the International Prism Award, a prestigious honour from the International Coach Federation that recognizes the impact of UBC’s rigorous coaching programs in all its facets and in a number of areas, from personal development to shaping the organizational culture and addressing strategic goals. Across the organization, UBC encourages students, staff and faculty to lead through a coach approach to discover and explore new ways of learning – from leadership programs to performance conversations. Since 2001, over 4,300 faculty and staff have accessed free, one-on-one professional coaching services through the Coaching@UBC program and Career Navigation and Transition services. The community of coaches currently includes 55 internal coaches (those coaches who also work at UBC) as well as 27 external coaches. UBC also offers staff and faculty electing to pursue ICF-accredited coaching training access and scholarship awards for the UBC Coaching Internship Program. UBC was shortlisted as one of four global finalists earlier this summer, and the award was announced on Sept. 26, 2018 at the Human Capital Institute’s Learning and Leadership Development Conference in Chicago, Illinois. Congratulations to all! Coaching@UBC provides an opportunity for faculty and staff to focus and move forward on career goals through the exploration of ideas and candid dialogue with a confidential and unbiased thinking partner. Learn more. We are pleased to announce the recipients of the President’s Service Awards for Excellence and the President’s Staff Awards, presented by the university annually to recognize staff members who demonstrate outstanding achievement and excellence within the UBC community. The President’s Service Award for Excellence is presented each year to up to five outstanding staff members who have made outstanding contributions to the university, and who excel in their personal achievements. The President’s Staff Awards at the Vancouver campus recognize the personal achievements and contributions that staff make to UBC, and to the vision and goals of the university. 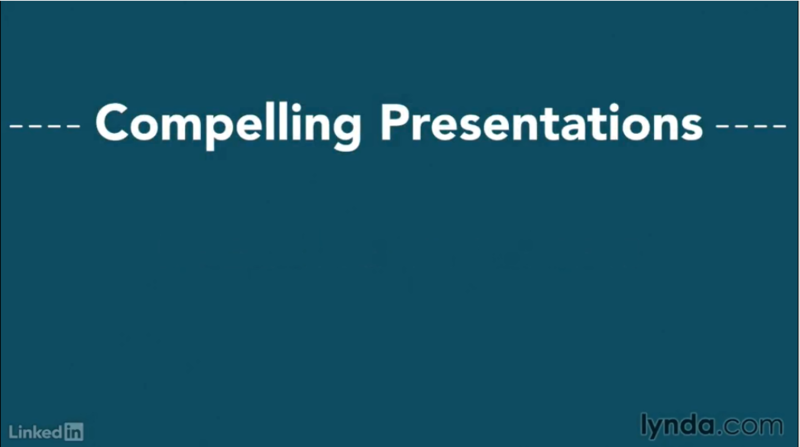 Learning with Lynda: What makes a compelling presentation? Knowing how to deliver a compelling presentation that leaves your audience fulfilled, informed and inspired to take action is one key way to increase your credibility and influence at work. In this short Lynda.com video “what makes a compelling presentation”, you’ll be introduced to 7 steps you can take to make your next presentation a success. Visit our lynda.ubc.ca website to learn more. Every team faces conflict, and as a leader it’s important to know how to guide your team through these trying times. Conflict Theatre just might be the edge you are looking for to bring your conflict management skills to the next level. The deadline to apply has been extended to June 14. Sign-up today through the online application. Visit the Conflict Theatre website for more information. The Suicide Awareness Working Group is recruiting staff and faculty members who are interested in becoming QPR (Question, Persuade, Refer) instructors at the Vancouver campus. This is a volunteer role and full training is provided. If you are interested in becoming a QPR instructor, please read this Info Sheet and complete a brief online application by Wednesday, June 13, 2018. Training will take place on June 27 and 28, 2018. If you know a staff or faculty member who may be interested, and you are supportive of their use of time toward this initiative, please encourage them to apply or share the Info Sheet with them. Questions about the QPR instructor training program? Contact the Co-chairs of the Suicide Awareness Working Group: Tam Uden or Kelly Eaton. You have 20 seconds to hook your audience. You have 2 minutes to hold them. Learn how to do just that in this fast-moving, interactive, practical learning experience on July 4, 2018. Designed for both new and experienced presenters, this workshop is for anyone who wants to learn to deliver a forceful presentation that will educate, motivate and persuade their audience. transforming your anxiety into enthusiasm – and more! For more information and to register, visit the HR Catalog. On May 31, HR issued a memo regarding the Changes to Minimum Wage in British Columbia Effective June 1, 2018 (May 31). Please contact your HR Advisor/Associate if you have questions. On May 25, HR issued a memo regarding the M&P Compensation Review – Pay Grade and Salary Administration, Phase 3 Effective July 1, 2018. The UBC Staff Pension Fair takes place on Thursday, June 21 from 11:30 a.m. to 1:00 p.m. The fair will be held at the Robert H. Lee Alumni Centre. This is a drop-in event; no RSVP is required. Miranda Massie (Health Promotions) is holding a preview of her new training session, “The Working Mind”, on June 20 and invites anyone in HR who is interested to attend. The session will be held from 9:00 a.m. to 4:30 p.m. at TEF III (Room 610) and only 25 spaces are available. Please email her by May 31 to save your spot. The Working Mind is a Mental Health Commission of Canada, evidence-based workplace training program aimed at increasing mental health literacy for both supervisors/managers and employees. In advance of rolling out this program to the campus community, all HR staff are invited to preview the training to ensure that it aligns with current UBC policies and procedures. The manager/supervisor version of the training includes information related to duty to enquire, accommodations, return to work, along with the other program elements. Please note: Miranda will be presenting the manager/supervisor version on June 20, but all HR staff are welcome to attend. Read on for more info about the program, including details about the employee and manager/supervisor course content. To register, please email Miranda Massie. Open to all UBC staff and faculty, this four-week challenge is a fun and inclusive way to keep fit with your colleagues. Weekly prizes draws, including overall prizes for the top team and top individual. Step on up and register today! In April, UBC launched its new strategic plan, Shaping UBC’s Next Century. The vision and goals are now available in a simple poster format and will be distributed across the Vancouver and Okanagan campuses, and other learning sites. You can also print your own copy to display in your workspace [printable PDF]. Faculty and staff are invited to comment on the Proposed Policy #7 (Occupational and Research Health and Safety Policy) and its related procedures (collectively referred to as “Proposed Policy #7”). Proposed Policy #7 establishes consistent, up-to-date, standardized, and subject matter specific procedures related to health and safety. This is intended to ensure all preventative measures are appropriately taken to eliminate unnecessary risks, injuries, and occupational diseases, arising out of UBC’s workplace, teaching, and research environments, in order to sustain UBC’s reputation as both a leading research and teaching institute and employer. Faculty and staff are invited to submit any comments to the Office of the University Counsel at university.counsel@ubc.ca by September 30, 2018.